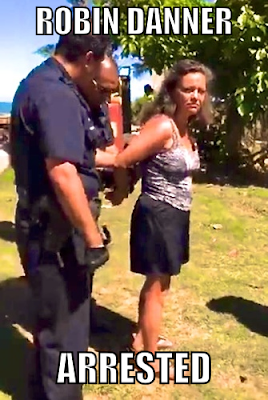 ANAHOLA — Prominent Native Hawaiian activist Robin Danner and her son were arrested Wednesday during a confrontation with state Department of Hawaiian Home Land enforcement officers and officers of the Kaua`i Police Department over a disputed campsite near Anahola Beach Park. Danner, 55, and her son, Garrett, 34, were booked at KPD headquarters on trespassing and government obstruction charges for allegedly interfering with a DHHL raid on an encampment linked to an ongoing dispute between the agency and the Anahola Hawaiian Homestead Association. The controversy centers on the encampment and a Neighborhood Watch platform constructed about a quarter mile away at the organization’s Kumu Camp facility. 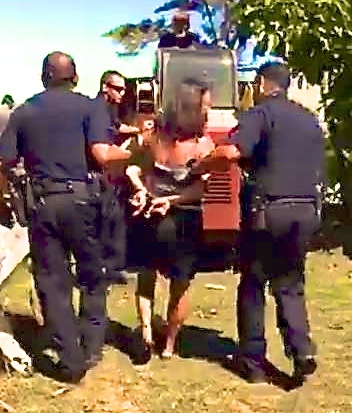 ...Shortly before she was taken into custody, Danner accused DHHL enforcement personnel of acting illegally and standing in the way of her organization’s efforts “to provide homes to DHHL beneficiaries.” She accused DHHL personnel of threatening her with arrest because she swore at them.